A very Happy New Year to you all. I hope you had a good Christmas break and are settling back well into old and new routines. At Angel and Blume we are all marveling at how clean and fresh everything looks now the Christmas decorations are coming down and with that in mind, I have been starting to think about freshening up our website. We were very busy at the end of last year photographing a few of the projects we have been working on recently. One of the first to go up on our website is this beautiful central Cambridge home and you can see more images on the portfolio section of our website. This spacious kitchen dining room has a wonderful view of the newly re-modeled garden and a stylish and practical table and chairs from Joined and Jointed looks great in this space. The glorious sitting room window is not only a lovely place to sit but is also a huge sash window that pulls up to allow access to the garden – a discovery we were rather thrilled to make! The clients had some lovely photographs taken by a member of the family and these worked beautifully in the study room along with a statement sofa and rug. We love designing children’s rooms and this was no exception. Animals were a bit of a theme here including a rather fabulous Love Frankie Leopard Walk lampshade. Watch this space for more projects to follow as the year unfolds! Wishing you all a very happy and restful festive season and a good year to follow, from everyone at Angel + Blume. Images taken at one of the homes at King’s Row, Ely, a development by Palace Green Homes. Interior design and show home by Angel + Blume. Photography by Peter Bennett. It’s always great to get your hands on an interior design book that is full of inspiration and ideas, and Creative Living London has a little twist; all of its featured homeowners may have inspired you already, as they are all creative designers, stylists and artists. The through the keyhole vibe of this book gives the reader a wonderful insight into some of the most beautifully decorated homes in London; full of personality, style and of course creativity it’s a fun display and great way to get inspired. Here are a few of my favourite shots from the book. This dining area in stylist Marianne Cotterill’s home is full of bold style choices and beautifully contrasted elements. 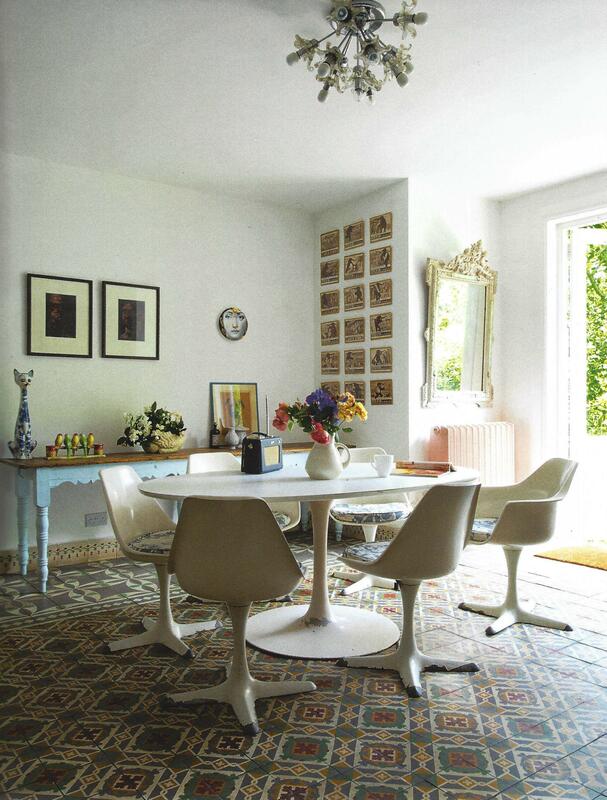 The futuristic style of Eero Saarinen’s Tulip chairs and table against the original Victorian tiles are the perfect style clash. I especially love the pastel pink radiator in the background, a fun stylish addition. 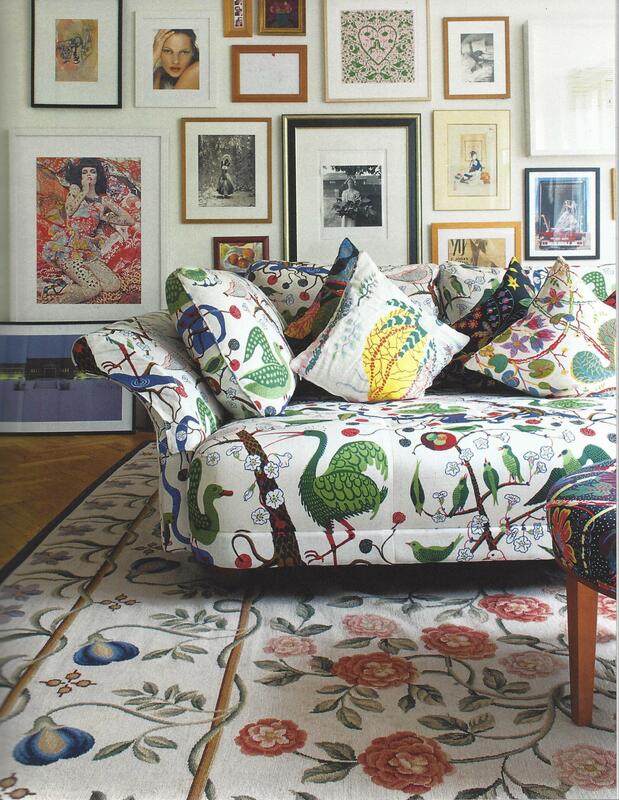 While we’re on the subject of perfect clashes, Lisa Eldridge and Robin Derrick’s living room is full to the brim of different patterns that all work seamlessly together, even the gallery wall of paintings and photographs acts as its own pattern in a sense. The two bold fabrics from the rug and sofa shouldn’t work together but somehow do, along with the plush scatter cushions, a multi pattern room technically shouldn’t look soothing and calm, but they managed to nail it here. 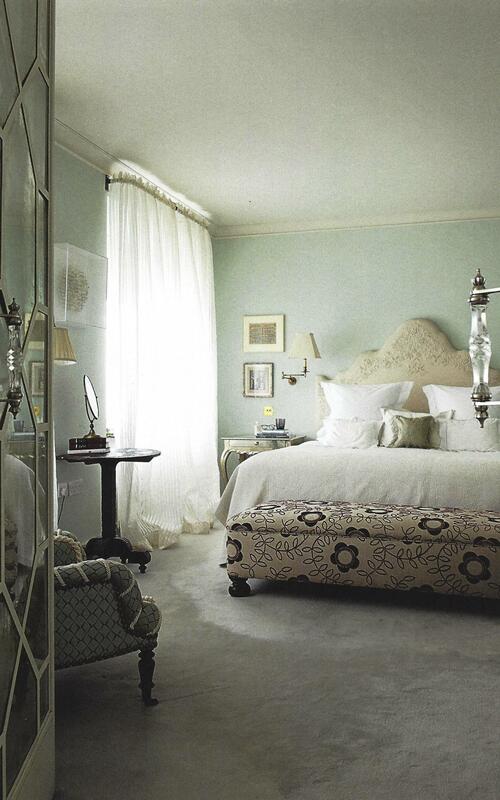 From busy and serene to minimalist and serene, this simply dressed bedroom is utterly beautiful. 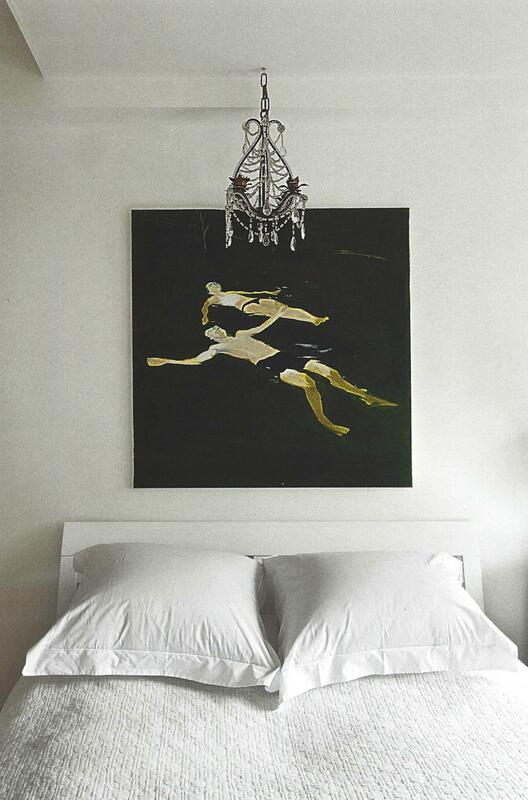 The painting along with the petite glass chandelier are an interesting combination, while the crisp white bedding allows them to do all the talking. 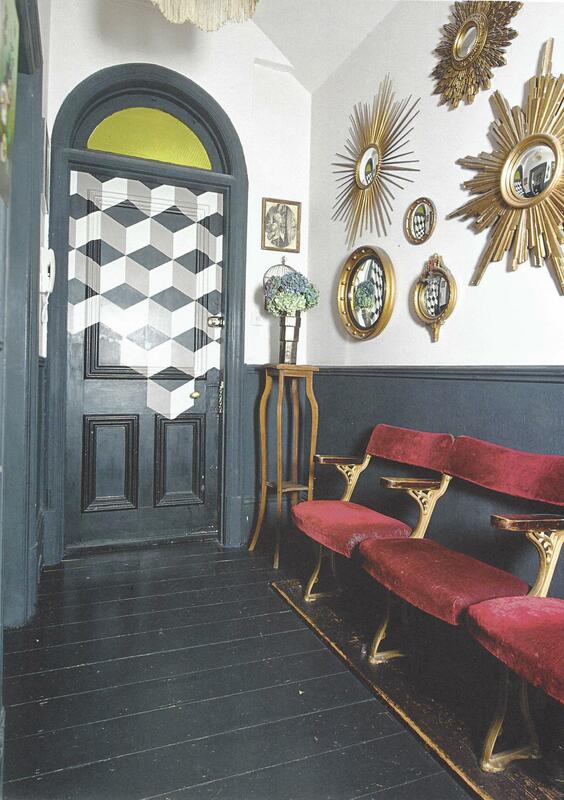 Fashion stylist and art director Claire Durbridge and Bob Sakoui have decorated their hallway in a unique and fun way; the geometric painted pattern on the back of the front door adds a sense of humour to the glamorous entryway. The gold assortment of mirrors and the vintage cinema seats with sumptuous berry red velvet creates a standout feature. 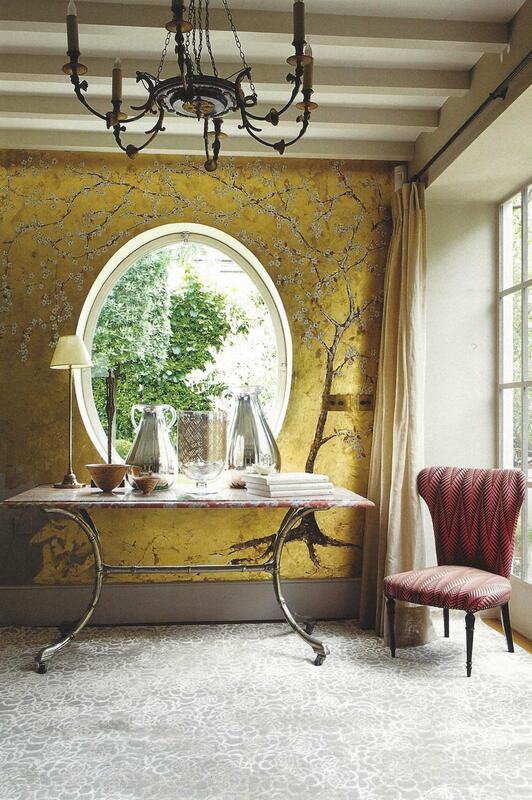 There is a really beautiful sense of bohemian glamour in interior designer Jo Berryman’s home. 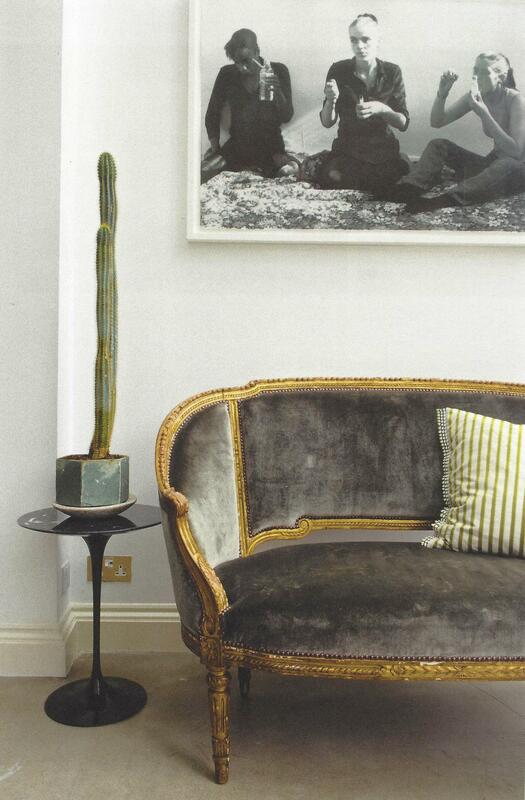 The single tall cactus in its hexagonal pot next the antique Louis sofa is effortlessly put together. Moving onto the bathroom, its chandelier, roll top bath and seating area are all elements that seem a little too much in theory, but here they all work into a scheme that would seem wrong without every piece. Neisha Crosland is a wonderful textile designer, and her home perfectly suits her aesthetic. A quick look at her dining room and London might not be your first thought as to where it was located. The Japanese tree mural is simply stunning with the blossom tree framing the outside trees wonderfully. The embroidery on her headboard is another amazing and intricate addition to the house. I absolutely love the effect that these glasses storage boxes and long pile rug create, giving the boxes a textural feel. 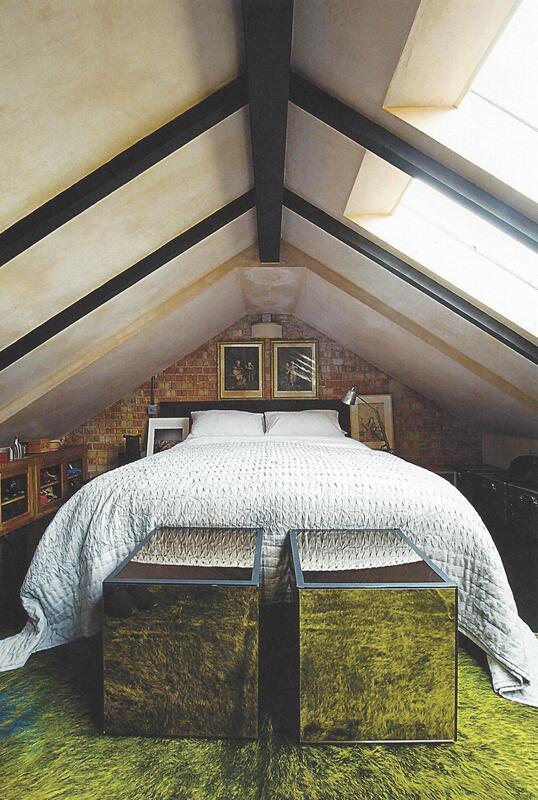 This cosy bedroom of interior designers Joelle Talmasse and Martyn Gayle proves that you needn’t been deterred by the prospect of an attic room and sloping walls. What really caught my eye in this dressing room was how wonderfully retro it was, and yet still felt contemporary due to the wallpaper. The shining star of this room for me however, is the chandelier which is just a beautiful little touch. When so many interiors are so serious it’s always great to see one that has a strong element of fun in it, without jeopardising the style and sophistication. 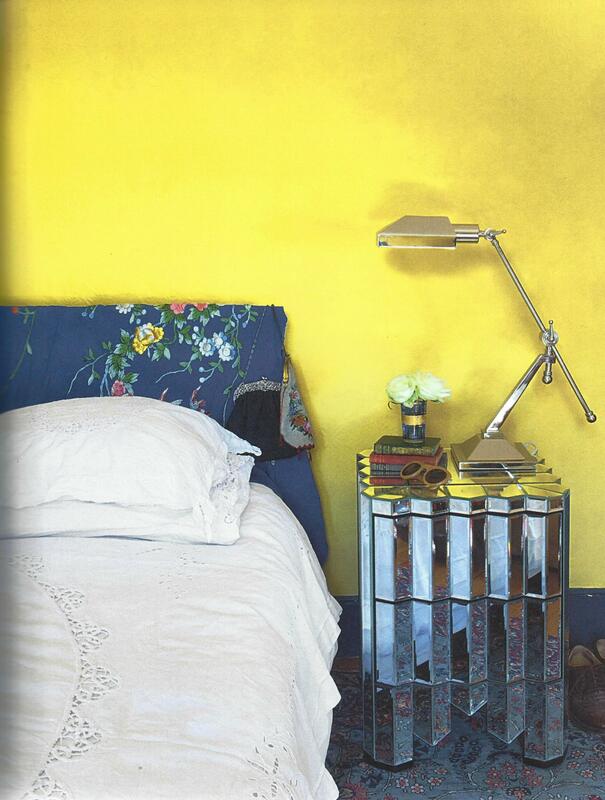 Mawi Keivom, a jewellery designer, offset’s her electric yellow wall with a bold embroidered blue and white bedding; the whole look has a soft, romantic feel in a contemporary, atypical way. 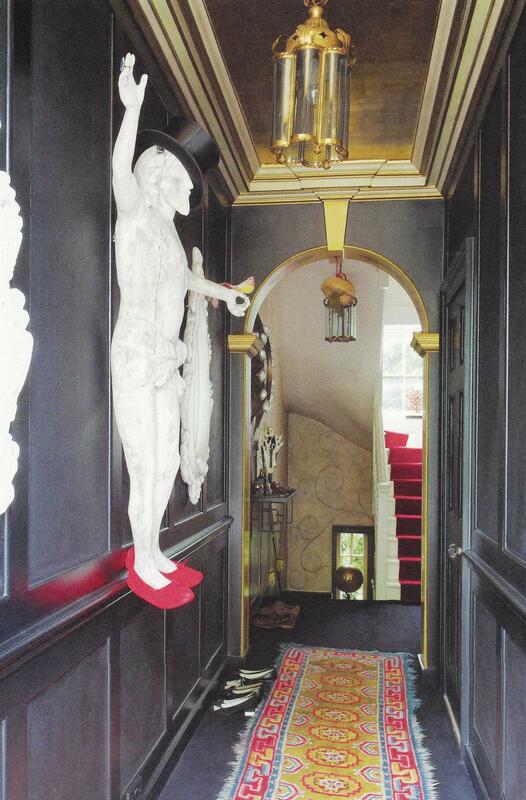 There’s a lot going on this narrow hallway in the home of David Carter, an interior designer. There’s a great deal of whimsy, man in the red slippers hanging elegantly on the wall for one. 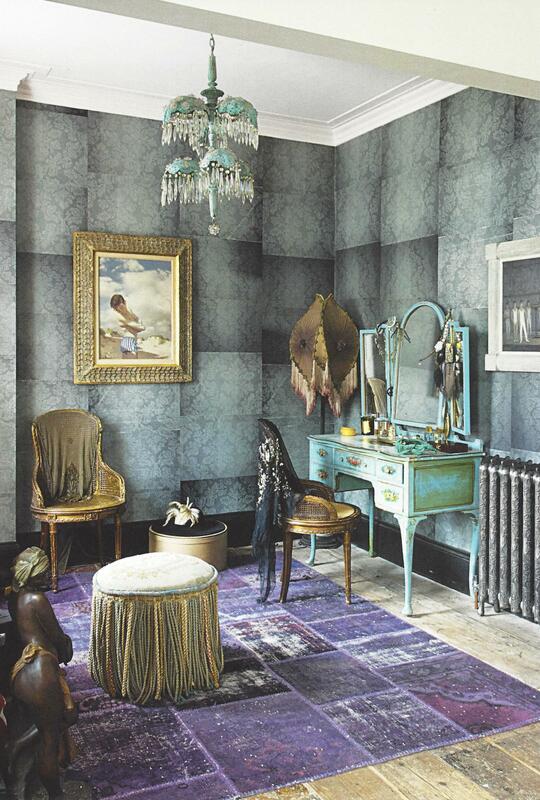 The dark black walls and gold ceiling fit the space well and the pops of colour give it a touch of life. 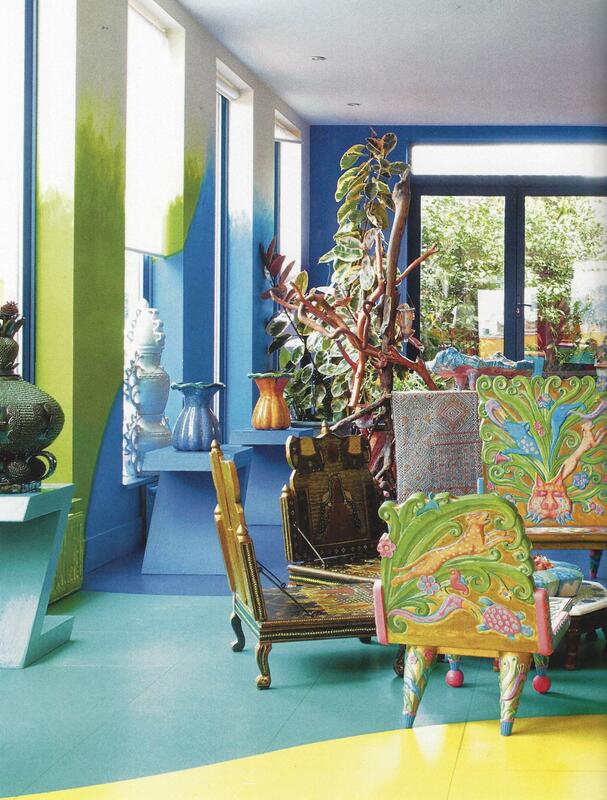 If I had tried to imagine Zandra Rhodes’s London home, I probably would have conjured up something similar to the reality, but nowhere near as perfectly curated. There’s a real sense of eclecticism to the style going on here, from the collection of vibrant chairs, to the vases with their own stands, it’s both wild and collected as the same time; chaotic and calm. A neon yellow, high gloss finish on tongue and groove floor to ceiling panelling might not sound like a good idea, but after seeing Annie Morris and Idris Khan’s home, the jury’s out and opinion’s starting to change. The look is soften by the use of the rustic wooden sideboard and by reintroducing the colour palette in a piece of art; it definitely makes you want to explore the home further. Creative Living London is a fantastic book if you’re looking for inspiration and unique ways to approach decorating a home. Full of beautiful images and words, a great buy to add to your collection. 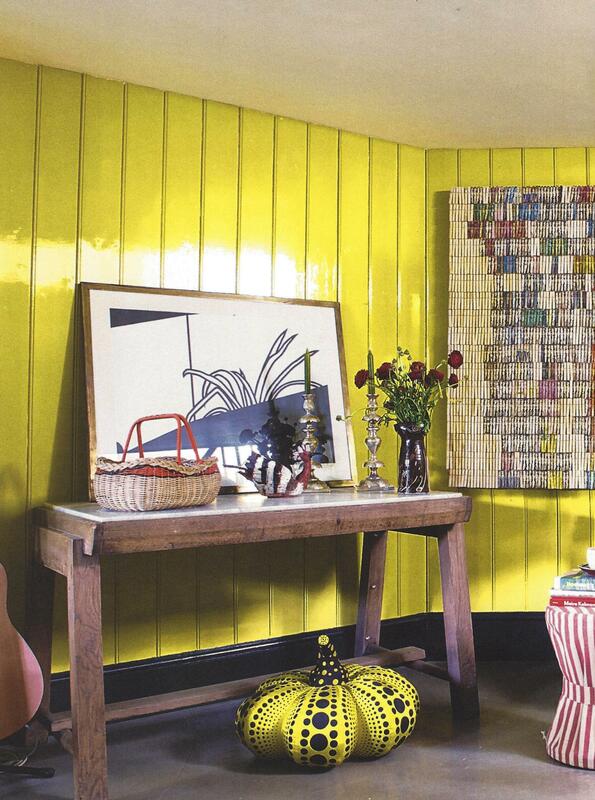 Creative Living London is written by Emily Wheeler, photographed by Ingrid Rasmussen and published by Thames & Hudson. More often than not, depending on our lifestyles, its common practice that most people need a little space in their home for a desk or a small home office area. Whether you’re studying, working from home, or have daily tasks to carry out, a desk is always a handy item in the house that you’ll always find a need for. Your workspace in an office may have to comply with its surrounding aesthetic, but at home you have the freedom to create your own individual space that works perfectly for you. From picking the desk, chair, accessories and the surrounding area, making your space your own is a lovely way to make productivity just that little bit easier. When I think of a traditional writing desk I always picture something like this quaint piece above. A sweet style that’s perfect for a country themed interior. A desk like this with built in compartments is ideal if you don’t have a dedicated room as an office; instead of taking up precious space with larger storage you can neatly fit letters and envelopes, pens and documents in the drawers provided. It turns the desk into a design feature of a room, rather than something that’s in the way. I love this Repton writing desk from Oka, with a similar style in a wood finish; an elegant, design for a traditional setup. Continue with the traditional theme with your desk accessories and lighting. This Charles Edwards table lamp has some wonderful detailing, but is simple enough to work with most traditional design, and will keep your area well-lit when working into the evening. For a few extra finishing touches, a piece like this letter rack by Alexander James available at Amara, has a traditional glamour to it, giving your desk style and a touch of personality. If you prefer a more contemporary style, there are many ways to create an interesting and productive workspace that’ll look sleek and stylish as well. This look below is clean and simple; the reinvented half white, half natural wood captain’s chair is a great way to rework a traditional piece. This desk from Bluesuntree has the capacity for a bigger workload with a large surface and three handy drawers underneath, but its style isn’t compromised as it gives a modern, stylish but relaxed design. Pair it with a slightly more avant garde style of chair, like this legendary Masters Chair by Kartell available from Heal’s in a range of colours; but add a cushion to keep it comfy if you plan of being at your desk for a while. You may mostly work from a laptop these days, but every now and then are in need of jotting down some notes by hand, so a trusty notebook and pen should never be too far. Keep your pens in a stylish home, in something like this holder made by Lexon; it’s sleek and cool, and will keep your desk feeling tidy. If you love retro style interiors, there’s no need to sacrifice this when it comes to your workspace, you can find good quality buys on places like eBay, or some new desks in a retro style if you like as well. This image below is a beautiful home workspace design; with the teak wood, retro desk legs and lots of greenery it makes a peaceful space to work in. For a similar style, this mid-century inspired Acorn desk from West Elm will help keep your retro aesthetic going in your workspace. Keep the look going with some retro framed prints, or an interesting collection of coffee table books nearby. Give your space some refreshing plant life, and house them in a stylish planter like this one from La Redoute; it has some mid-century style to it, but could also be worked into another design scheme. Storage is always vital, especially with a workspace as it’ll keep all your paperwork tucked away and not scattered about the place, keeping you feeling organised. If you’ve got the space, a larger storage piece like this one from Oliver Bonas is a great way to keep your documents, books and other items at bay, while there’s also enough room to add some ornaments or plants to stop it from looking too much like work. I love this relaxed, cosy style of this workspace; with the mismatching tables, sheepskin cushion and the lovely array of little bits and bobs scattered around. The bohemian style is fun to use in your workspace if you don’t need a large amount of space, needing the desk more for fun things then for work. This design from Maison du Monde is a chic design that have a wonderful cosy feeling to it, great for tucking in a corner somewhere, as well as dressing up or down with some interesting accessories. Keep the place feeling even cosier with a rug under the desk; something like this kilim rug from John Lewis, which makes a great bohemian base for your area, plus it’ll look good against some dark wood floor boards or if you want to add some faux sheepskin. And for an extra bit of flair, something fun like these rabbit bookends are a playful touch to your writing desk, and a handy way to store books or papers. There are all kinds of ways you can create your own workspace at home, making it an inviting place that you look forward to using instead of a feeling of dread. Adding your own style and personality to your space will make it feel like a connected part of your home and not just an office! If you love styling your home, there’s a good chance creating a beautifully tailored table setting is at the top of your to-do list. There’s no fixed way to create a gorgeous looking table, from simple, clean looks for more extravagant, it really boils down to your own personal taste, and your what your lifestyle requires. From day-to-day dining to those special occasions, a beautiful table setting is the key to turning even the simplest of meals into something of a celebration. This setting above follows a clear theme; showing that all your plates and bowls don’t need to be from the same set, as long as they co-ordinate. The simple colours tones gives off a contemporary feeling, and works as a great canvas to display your food. By having a simple foundation of tableware it can make it easier to introduce the stars of the table, like some gorgeous cutlery or a decorative serving bowl. For a simple setting like this one, I would keep to the minimal theme, but add in something to stand out from the rest, like these beautiful mugs from Arrow + Sage, a great way to add flair to your normal breakfast or a Sunday brunch. Giving your table some extra pizazz when you’re entertaining will not only make the room and table look distinctive, but make your guests feel like they’re getting the special treatment too. This setting really stood out to me as an innovative way to use your regular tableware and with just the a few small additions to make it seem like it was design especially for your event. With woven placemats, wooden handle cutlery and tan leather napkin holders, there’s a simple rustic feeling going on, and by simply placing a fern leave under a glass plate the table is given a flash of excitement. Although this might be a little over-the-top for some, keeping a table feeling fresh and lively with some plants and flowers is always a great idea. For a similar look, these place mats from West Elm are a great starting place if you want to create a rustic, natural styled table setting; you can choose to stick with the Natural finish, or mix up your look with either the slate or charcoal. If you like the idea of a glass dinnerware, I love this design by Catesby’s, the bobble detail on the rim is a sweet touch that can give your setting an individual feeling. You may want to embrace your inner theatrical side with a luxuriously dark table setting. This sleek black setup is simple yet oh so effective; the dark tones give off a sophisticated vibe, perfect for instantly switching from regular dining to a dinner party. This rich bronze colour plate from The Conran Shop will add a beautiful, glamorous feeling to your table, and help to recreate this dark and mysterious look if it has you feeling inspired. Finding some stand-out pieces of crockery can really make your table look great. Whether it’s a large serving platter, or maybe a set of sweet side plates, discovering a design that really speaks to you will make your setup feel all the more distinct. This Aztec hand-crated design by Suzanne Sullivan is mix between bohemian and glam, making it the perfect unique piece to show off your style. By using an eye-catching patterned design for your stand-out piece, you can choose to have simpler, less expensive surrounding pieces, and still keep the table looking smart and stylish. This well thought out table has been given a really contemporary, luxe look. There is a perfect balance between the three main colours, black, gold and white, giving an overall crisp, sharp and glamorous look. This a small table, but its setup shows that you don’t need a banquet hall to make your dining area feel like royalty. To test the gold plate waters, a little number like this patterned plate from H&M Home, is a fun and stylish way to see if the theme is for you. And if you think you’re ready to take the leap, go all out with these devilishly glitzy plate from Amara by L’Objet. There are so many ways to creative with your tableware, from finding pieces to make your everyday a little more exciting, to thinking outside the box when it comes to entertaining and creating a statement. Your dining table is the perfect place to experiment or push your style and have some fun in your home. Lighting is an integral part of any design scheme, it’s not only about getting the right form of lighting for a room (ambient, task, accent) but also choosing a fitting that will work perfectly with the look and style of your chosen scheme. There are so many options available when it comes to light fittings, from small and minimal to big and dramatic, that it can all seem a little overwhelming at times. But you don’t have to settle for the ordinary or the expected, instead choose to make your lighting the talking point of your home, no matter what your style. I’ve pulled together some ideas in six different styles to inspire you and your lighting needs. If you have a minimal scheme running through your house, it’s unlikely that you’ll want to interrupt this look by adding in some flamboyant lighting pieces. Going for simple pendants doesn’t mean you need to settle for plain. This pendant like from Original BTC is just stunning, it’s a simple design but the use of the black instead of a typical glass pendant gives it an edge over other similar pieces. Featured against a crisp white wall will create a strong, but low-key statement in your home. These pendants from Benchmark have a modern Scandinavian feel about them. The slits in the shade give the wooden structure a light feel, making it ideal for a minimally dressed room, and depending on the colour scheme, you can use the natural, white or black finish. They’ll make a great addition to a light, airy, modern space. The industrial trend has been a popular choice in the interior design world over the past few years, with the style showing up in furniture, accessories and lighting. It’s a strong look and with the right building and attitude, can be pulled off to perfection, but it’s important to make sure the trend doesn’t engulf you. To add hints of the style into your lighting, opting for designs that are less obviously industrial will make any future transitions easier to accommodate, you can also apply subtle industrial features to a scheme without completely changing it. I really like this Anglepoise original lamp that’s been given a cosmetic lift with some industrial style additions. The brass accents and the black shade gives the contemporary lamp an industrial undertone. For an industrial style pendant that will stay in style for years to come, blending it with some contemporary elements is a failsafe option. This Edison bulb is caged by some modern wiring and along with the addition of some coppery tones, it gives the pendant a well-rounded contemporary look, which would give an industrial scheme a breath of fresh air and a contemporary scheme a hint of that vintage vibe. When opting for a contemporary style of lighting, it’s your chance to get a bit creative and turn traditional ideas on their head. A chandelier for example might be considered a traditional style, but today there are many modern designs that adopt its look. This cluster chandelier from Fritz Fryer gives the term a whole new meaning, the translucent shades and the bright red cables name together wonderfully to create a sharp, sophisticated look. It’s a design that would look amazing in a high-ceilinged hallway, making a strong feature to any house. A floor lamp is not only a great way to light up a dark corner, but can also make its own style statement. It contemporary piece from Artemide oozes with confidence, with a futuristic element to finish off the look. The streamline design could be paired with a sharp, masculine interior to really show it off. Lighting in a traditionally styled space can be utilised to give the area a clean, fresh and punchy impact. Table lamps in a traditional setting can be the perfect way to add some detailing to a room, the patterned vase from the Abbeywood design from Vaughan has a lovely traditional feel to it, and it kept fresh with a crisp white shade. The elegant piece would look great as a pair on two end tables in a living room. If you have a period property, or want to add some traditional glamour, a dramatic ceiling light can add character and really cement a room’s style. This chandelier from Bella Figura has a classic style and refined nature to it, giving a room a sense of understated grandness. A hallway could be an ideal spot for this piece, making sure you have something eye-catching when you first walk in to the house. With a bohemian, eclectic style there is always the challenge of making sure a room isn’t so overloaded with patterns, styles and things that it loses its stylish essence. Incorporating a vibrant lamp into the mix can be a good way to incorporate colour and pattern in a small way instead of large pieces everywhere. Pooky is a fantastic lighting company that has some lovely, bohemian style lamps to hand. They’re the perfect colourful finishing touches to really make a room pop. I love this hand-blown Iris base with a fun shade to go with it, creating a great blend of sophisticated colours in a playful nature. A tasselled lampshade might have once been something you found in your grandma’s house, the shade an unsightly floral pattern and the tassels old and frayed. But these pendants are reinventing the style and giving something fun and wacky back. The luxurious gold tassels contrasted against the abstract shade design gives you a perfect Boho chic shade to add into your home. When done well, a glamorous style home can look breath-taking, but it’s a theme that needs the right confidence to pull off. Lighting is a great way to add in some beautiful finishing touches for a glamorous setting. A glamorous interior usually consists of dark hues and metallics, so add in a hint of luxurious colours with something like this Amelia table lamp from Heathfield. The wonderful glass base is framed with gold accents giving it a rich, elegant feel. I love this beaded wall sconce from Graham & Green, it’s a really original way to use wall lights as a strong design feature, making a smart, elegant and glamorous light fixtures for your scheme. Finding the right lighting that suits your home, style and yourself can not only create a beautiful atmosphere in your home, but give your style a little lift, making everything just that little bit brighter.